The Low Carbon Kid: Why does the UK have lower energy bills but rising fuel poverty? Why does the UK have lower energy bills but rising fuel poverty? Note: A version of this piece first appeared last week on The Fifth Estate. Average fuel bills have fallen and investing in energy efficiency does not need to push up energy bills according to new research from the UK’s Committee on Climate Change (CCC). Yet a recent debate in the Houses of Parliament on fuel poverty shows that ministers still lack the necessary political will to tackle its scale and are complacent about the effect of their efforts. The UK ranks 14 out of 16 western European countries for fuel poverty, and ranks bottom for the proportion of people who cannot afford to adequately heat their home. Yet household energy bills have fallen since the Climate Change Act was passed – despite fears expressed at the time that measures to tackle climate change would push bills up. So why has fuel poverty slowly been creeping up? The fuel poverty gap, which is a measure of the difference between a household’s energy bill and what it can afford to pay, increased from £235 in 2003 to £371 in 2014, according to Rebecca Long-Bailey the Labour Party Shadow Secretary of State for Business, Energy and Industrial Strategy. Real wages have fallen over the last decade since the banking crisis and the austerity politics era begin. That's part of the picture. But there is more. Compared to Sweden. Britain’s winters are mild yet due to good insulation of homes levels of fuel poverty in Sweden are about half those of the UK. A typical Swedish wall is three times more energy efficient. So what is going on in the UK? Why have fuel bills fallen? “Changes in annual energy bills from 2004 to 2008 and from then to 2016.” Source: CCC analysis. Estimates are for the average dual-fuel household with gas heating. 2016 estimates are based on consumption of 3,550 kWh for electricity and 13,500 kWh for gas. Note: 2004 is the first year for which comparable data is available to allow comparison over time. Fuel bills in Britain have fallen not because of energy prices falling or homes being better insulated but because more energy efficient goods are on the market. 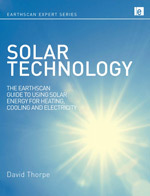 This is in line with patterns found in Australian energy consumption. Although the cost of measures to deliver a cleaner, low-carbon electricity system have added around £9 a month to the typical UK household energy bill in 2016, this was more than offset by a cut of over £20 per month due to reduced energy demand mainly from more efficient lights and appliances (according to the CCC’s fourth independent assessment of the impact of carbon budgets on energy bills). 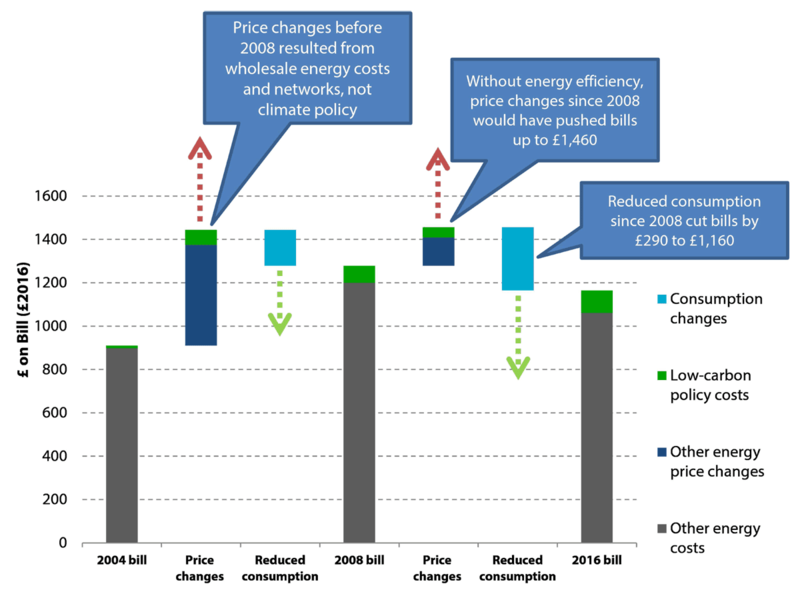 This assessment finds that typical households which use gas for heating/hot water and electricity for everything else, paid (in real terms) £115 less per year for energy in 2016 than they did in 2008 when the Climate Change Act was passed. The total annual bill includes just over £100 to pay for decarbonisation measures. 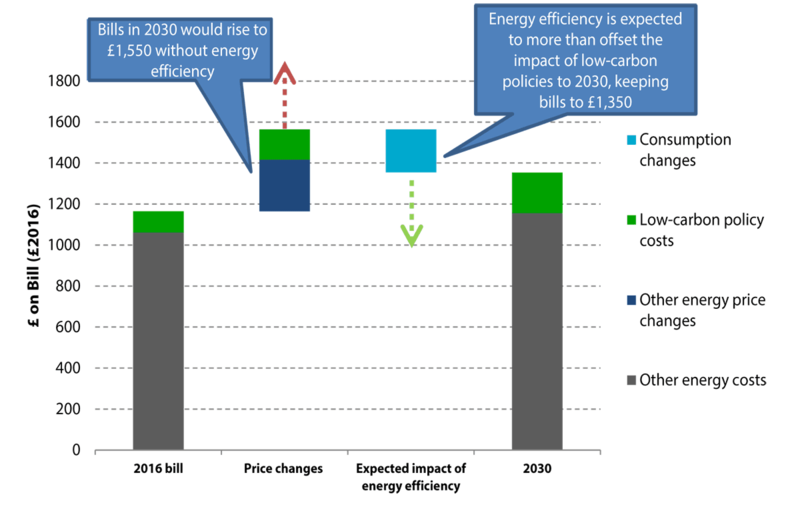 Improvements in energy efficiency have saved the typical household around £290 a year since 2008. 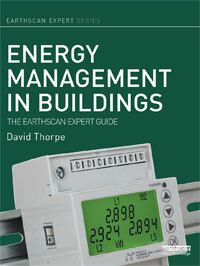 This is largely due, as Green MP Caroline Lucas pointed out in the Parliamentary debate, not to the refurbishment of homes but to a European Union directive – the Ecodesign Directive – which, she said, is projected to produce average annual savings of £153 by 2020 – 20 per cent of the average annual energy bill. This has been so successful that it has led to the virtual phasing out of all inefficient goods, including household appliances, boilers and windows, below the A rating since the energy rating label for goods was introduced 20 years ago. 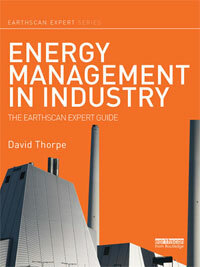 It has encouraged the development of ever more energy efficient products. Consumer surveys show that about 85 per cent of European citizens look at energy efficiency labels when they purchase products. The European Commission last week therefore decided to replace the current confusing A+++ to G labels for products by a clear and easier to use A to G labels to make energy labels more understandable. Once this is approved by the European Parliament and the Council, product registration and public databases will be provided to make it easier for people to compare the energy efficiency of household appliances. But still fuel poverty is rising. A household is said to be living in fuel poverty if its income is below the poverty line and it has higher-than-typical energy costs. On 21 March, British MPs debated fuel poverty. The minister responsible for energy reminded everyone that in 2014 the Government adopted a target for England for improving the homes of all fuel-poor households to a band C energy efficiency rating by 2030. Along the way they are to be improved to a band E rating by 2020 and to a band D rating by 2025. Only 7 per cent of fuel-poor households currently live in a band C rated property – most in much worse homes. Improving E, F or G-rated homes to band D can reduce energy costs by an average of £400 a year. This is a lot more than the money saved by switching appliances to the most efficient, however much that helps. Besides, the poorest people cannot afford to buy new appliances. A revised Act of Parliament that obliges energy companies to refurbish customers’ homes is about to see 500,000 homes improved over the coming 18 months. This is an extension of the Electricity and Gas (Energy Company Obligation) (Amendment) Order, which will prolong the Energy Company Obligation scheme from 1 April 2017 to 30 September 2018. It is well overdue and its tardiness has created uncertainty in the industry. Seventy per cent of the support available under the Act will be directed at low-income homes. However there is currently no clear indication of what will happen to the obligation after 2018. New private rented sector regulations will target the least efficient F and G-rated properties from 2018 by requiring landlords to improve those properties to at least a band E.
There has been an 88 per cent fall in the number of measures taken to retrofit homes since 2010 as a result of government policies, according to Long-Bailey. Policies to date have failed to support the development of a large-scale sustainable market for energy efficiency investments. The Association for the Conservation of Energy believes this is “because there has been a lack of a stable and long-term framework within which the energy efficiency supply chain can develop its market. 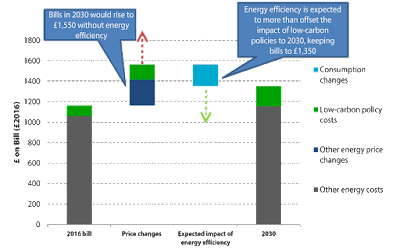 Energy efficiency policies have proved susceptible to decisions driven by short-term political priorities”. The Committee on Climate Change estimates that 4.5 million cavity walls remain un-insulated, 10 million easy-to-treat lofts could benefit from additional insulation and seven million solid walls are still without any insulation. The case for further government intervention is clear, but the political will to spend money on this area is lacking. It’s not just about bills. It’s about human health and winter deaths, of which 8000 were said to occur last winter due to fuel poverty. But if that fails to persuade MPs to take action there are financial arguments too. Analysis by consultants Frontier Economics suggests that the net present value of investing in insulating homes could be as valuable as the High Speed 2 rail link being backed by the government. It sees this type of investment as an infrastructure priority. Opposition parties Labour and the Greens, Plaid Cymru and the Scottish Nationalists are united with the NEA that the National Infrastructure Commission and the UK Government must act on the strong case for domestic energy efficiency to be regarded as a hugely important infrastructure priority. A further report by Cambridge Econometrics found that for each pound spent on insulating homes £1.12 is generated for the Treasury and £3 for the economy in GDP, and 42 pence is saved by the NHS. If it will not cost – but benefit – the taxpayer, will it cost the bill payer? “Central estimates for changes in annual household energy bill from 2016 to 2030.” Source: CCC analysis. Estimates are for the average dual-fuel household with gas heating. The CCC calculates that the gradual shift towards low-carbon electricity could add a further £85-120 a year to a typical bill by 2030 if further policies to meet UK climate objectives are put in place, but that further improvements in energy efficiency have the potential to deliver even more savings for households in future (around £150, or more if wholesale costs continue to rise). That’s a net benefit to consumers of at least £30. Jesse Norman, the Parliamentary Under-Secretary (Department for Business, Energy and Industrial Strategy), concluding the debate on fuel poverty for the Government, called their target to reduce fuel poverty “ambitious”. But seen in this context it does not appear nearly as ambitious as it could be. 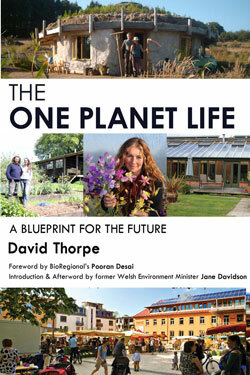 David Thorpe is the author of a number of books on energy, buildings and sustainability. See his website here. Trump, Putin and a new "axis of fossil fuels"